Luksus Oceanfront med HOT TUB - Båt, kajakker, paddleboards inkludert-PARADISE! Abaco Palms er kjennetegnet eiendom Abaco Palms Properties (Vennligst sjekk ut våre andre VRBO oppføringer - alt på samme vakre stranden! : Kokomo # 819533, Camp David # 819872, og Calypso # 819876) direkte på den vakre Casuarina Point strand - skritt fra vannkanten (se bildet). Abaco Palms har sin egen 16 'Carolina Skiff (som gjør alle våre eiendommer) - den perfekte båten for å utforske øyene, blå hull og private strender i nabolaget. Du vil finne mange bilder av huset og informasjon om ting å gjøre på Casuarina Point og i Abaco på vår nettside (Søk: 'Abaco Palms "). Vennligst besøk det for en komplett tur. Minimum opphold varierer, så kan du spørre. Vi har ikke en online kalender - så kan du spørre, og jeg lover å svare så raskt som mulig. Opplev spektakulære solnedganger fra det store havet dekk som har en Vita SPA badestamp, komfortable sitteplasser, og rustfritt stål grill for matlaging fersk fangst eller Caribbean hummer. Nyt den vakre, hvite sand privat strand fra dekk eller fra hengekøye under kokospalmer eller under tekket paraply. Abaco Palms 'stranden nivå har et lite bad og en praktisk utvendig dusj. Også ute på stranden nivå finner du en stor vask og teller for rengjøring av fisk du fanger eller de mange skjell du samler. Abaco Palms kan komfortabelt huse en rekke grupper. Abaco Palms har 4 soverom og 4 bad samt en strand nivå bad med utvendig dusj og vask for å rense fisk og shell samling. Den har to master soverom med king size-senger, privat havet balkonger, bad med boblebad boblebad og separat dusj, og walk-in closet. De to andre soverommene har queen-size-senger og eget bad, og man har en ekstra enkelt futon for slappe eller for å brukes som en ekstra seng. Hvert soverom har sin egen TV og hvert bad er flislagte. Bein fiske leiligheter er alle langs stranden og barrier reef er rett ut foran. Gå ut på leiligheter og samle sand dollar ved lavvann. Padle ut i kajakk eller padle bord til den lille øya utspring av revet, eller ta med din egen 16-fots Carolina Skiff å utforske de nærliggende øyene og oppdage din egen private strand. De mange store vinduene gir en spektakulær utsikt over stranden, havet og små øyer i front. Det fullt utstyrt kjøkken er satt opp til å håndtere et publikum og har granitt benkeplater, en ekstra ismaskin, oppvaskmaskin, innebygd mikrobølgeovn og stort kjøleskap. Spisebordet av Abaco Palms plass til åtte, og det er et spisebord for seks på dekk og ekstra sitteplasser i baren. Hjemmet har gratis trådløst Internett og Ethernet-porter og gratis lokale og Internett-telefoner. Som jeg sa over, vennligst ta kontakt med meg for tilgjengelighet. Jeg bruker ikke en online kalender, men jeg prøver å svare på alle spørsmål så raskt som mulig - noen ganger i løpet av minutter. Hvis jeg er på reise kan det ta litt lenger tid, men jeg se etter meldinger hele tiden. Vi vil gjerne ha deg besøke våre eiendommer! Vi har fortsatt Thanksgiving åpen for dette året 2018 - hvis det fungerer for deg! Hvis du velger å gå til Abaco, bør du se etter Abaco Palms. Du finner mye informasjon om Casuarina Point, og Abaco generelt: "Abaco Info" - Restauranter, shopping, akutt informasjon, medisinsk, apotek, dental - utforske Abaco, guidede opplevelser og en stor del på Casuarina Point: Fiske (rev , strand, spyd, fly, bein, etc. ), snorkling, kajakkpadling, padlebord, catering for spisesteder i etc. Vi håper du har en fantastisk Abaco ferie! Abaco Palms har en 16 fots Carolina Skiff, Telefoner (lokale og USA), air condition, trådløst internett og Ethernet-porter, utendørs dusj, et utvalg av strandstoler, et skyggefullt sted å sitte hvis du velger, en hengekøye, kajakker, padle boards , og en Vita Spa boblebad på dekk. Alt du trenger for en minneverdig ferie! Nødnummer og kontakter er i informasjonsboken ved huset, og også inne i skapdøren til Spice-skapet på kjøkkenet. Hvis du må avbryte av hvilken som helst grunn, refunderer du pengene dine (minus VRBO-gebyrene) for noen dager som vi kan bestille. Så ... jo tidligere avbryter du jo mer tid vi må ombestille og få pengene tilbake. Our family of 6 adults and a 6 year old boy thoroughly enjoyed our week at Abaco Palms, Feb. 16-23, 2019. The house, its water craft, the beach, and Marsh Harbour all combined to make for an amazing time. It’s located on a lovely beach with sand bars and several small islands in view. There are no resorts in the area, only other homes occupied by tourists and locals, so our neighborhood wasn’t congested or loud and the beach felt quite private. We walked the beach in both directions every day and also on the road behind the house. Abaco Palms was comfortable and well-equipped with beach craft including a small motor boat, and a number of paddle boards and kayaks which we used a lot. The water was relatively shallow, depending on the tide, which was nice for walking and looking for shells. We ate breakfast and dinner at the house and went out for lunch each day. The kitchen was well-equipped, and it was great to have a dishwasher and gas grill. Also a clothes washer and dryer. In the evenings we used the large hot tub. The palapa and hammock were nice, too. . We kept our rental car in the parking spot under an overhang so it stayed cool there in the shade. Kathy Heacock was a joy to work with. She promptly answered all my questions via email, sent a lot of info ahead of time and provided more in a binder in the living room. To celebrate my husband’s 80th birthday we hired Debbie Burrows to cater a dinner. She cooked it at the house and everything was delicious, especially the conch fritters. Thanks, Kathy, for recommending her. We made use of the board games provided and also the wonderful keyboard/piano in the living room. Our son and grandson played it every day. What a bonus to have that. The beds were comfortable and each bedroom had a ceiling fan and its own bathroom. The neighborhood was peaceful at night, great for sleeping. We felt safe there. The people of Abaco were very friendly. Kathy’s property caretakers were great – we met Elmer and Cathy, Rex and Judie, and Julian. Even a man delivering some product from Ace Hardware was so personable and gave us suggestions for restaurants. The whole vibe on the island was laidback and welcoming. We would highly recommend Abaco Palms if you’re looking for a quality property in a quality location for a relaxing beach vacation. We’re hoping to go back. With the snow and ice we’ve had lately in WI, I wish we could be there now! Beautiful beach, accommodations, and more!!! Kokomo was thoroughly clean and well-maintained, with gorgeous beach/view, excellent floor plan (privacy for grandparents and adult children plus baby), and every resource we could want for home, beach/water adventures (nice boat, kayaks/canoes, beach towels & children's toys, fishing/snorkling gear, etc.). The Heacocks are genuinely gracious hosts. We look forward to returning to Abaco Palms!!! We loved the house and the beach. The rooms were large with amazing view and so nice to have a bathroom for each bedroom. The house did have some spices that we had forgotten and made cooking in so much nicer. The locals were super friendly and helpful. The best part of this vacation and the home was Kathy. She is the best home owner I have ever met. Super friendly and just a pleasure to talk to and is so knowledgeable. I would definitely recommend this house to anyone looking for a great vacation spot. We just stayed at Camp David for 20 nights on a family vacation. It was amazing! The house was clean and well stocked with anything you could need. Kathy has every detail covered. The beach and boat were great for exploring, the water is calm and clear which was perfect for our smaller children. We all enjoyed the hot tub and all Camp David has to offer. Casuarina Point is a wonderful place for a family to get away. We hope to make his our vacation spot again in the future! The cottage was big, bright, clean and comfortable. Ample seating if you have a large group. Can't complain about the views either....especially from the hot tub. Lots of equipment to play with - kayaks, paddle boards, and a fishing skiff. Excellent communication with Kathy, the property owner. She was always quick to reply to emails, very professional, and very accommodating. The cottage had a binder full of information - cottage instructions, maps, tide schedules and what to do/where to go. We will be back! Our family greatly enjoyed our stay at Abaco Palms which was a Wonderful Private Beach House at Casuarina Point, near Marsh Harbour Bahamas. It was like having our own private resort. We had a beautiful beach right out the back door of our beach house with the use of a motor boat, kayaks, surf boards, paddle boards, and other beach items. 100 yards out was some wonderful snorkeling reefs and many areas to fish. A Tiki Hut, Large Hot Tub, a hammock are all available to use. At night the sheer numbers of visible stars in the sky made it difficult to pick out the normal visible consolations. We had 3 couples and one single and plenty of room for all. The property was clean and kept well for a beach house. The owners were fantastic! We were lucky enough to have been there the same time Kathy and Gary were staying a few houses down the beach and they were very warm and welcoming to our family and very helpful during our stay. We with great enthusiasm recommend this property to family, friends or anyone looking to get away for a while. You can either cook, have someone cook for you or visit restaurants North in Marsh Harbour or South at the Sandpiper. Also plan a day trip to Hope Town and visit the lighthouse there. It's a quick ferry ride from Marsh Harbour. We did so much and had such a good time that I could go on and on. 5 Stars from the Blacklidge Family! We usually require a one week minimum, but in many cases can offer a shorter stay. 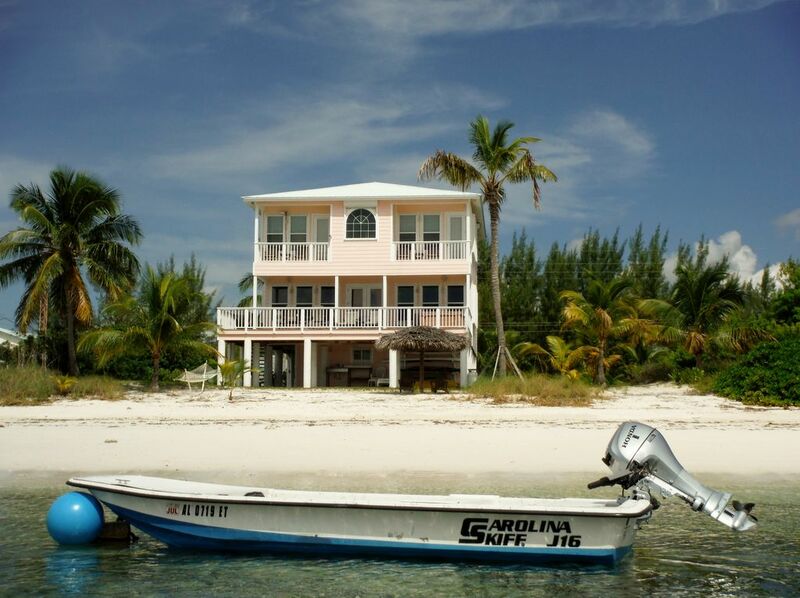 Abaco Palms rents for $5000 per week; $650 per additional night, plus 10% government tax. Questions? Contact Kathy. Please email me at KathyHeacock@gmail.com. When I am out of the country I do not receive messages on my US cell phone - so email is definitely best! Thank you!